As any eagle-eyed fan of the Deadpool franchise can assure you, Deadpool 2 featured a truckload of Easter eggs. From Deadpool (Ryan Reynolds) wearing Professor X's Cerebro helmet and taking the mutant's wheelchair for a spin around the X-Mansion to the Merc with a Mouth rocking an iconic shirt from The Goonies as a nod to Cable actor Josh Brolin's filmography, the pop culture references were plentiful in the Deadpool sequel. But there was one X-Men-related Easter egg so well-hidden that it likely slipped right under your radar. In the Deadpool 2 commentary track, a special feature on the film's home release, director David Leitch and screenwriter Rhett Reese chatted about a card Deadpool holds during the opening montage of the Merc's hits. It appears to be a credit card, given the chip in the lefthand corner, and it's stamped with a tiny illustration of what looks like a bonsai tree and two Chinese characters written in black ink. Pretty cool-looking, but also superficially insignificant, right? 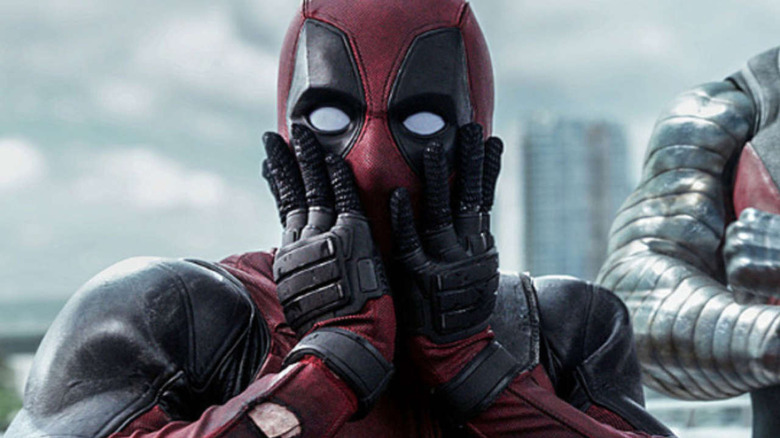 Leitch revealed that the markings are actually a "cleared name" and that there's "no lawsuit pending" on the Deadpool sequel's use of it (via Heroic Hollywood). So what does that signify? Well, it seems to mean that Marvel gave the director, the film's creative team, and studio 20th Century Fox permission to include the name of a Marvel Comics character in the film. So, we've got a card featuring the name of a Marvel character that Leitch and company were legally allowed to use in Deadpool 2. But who's the character in question? 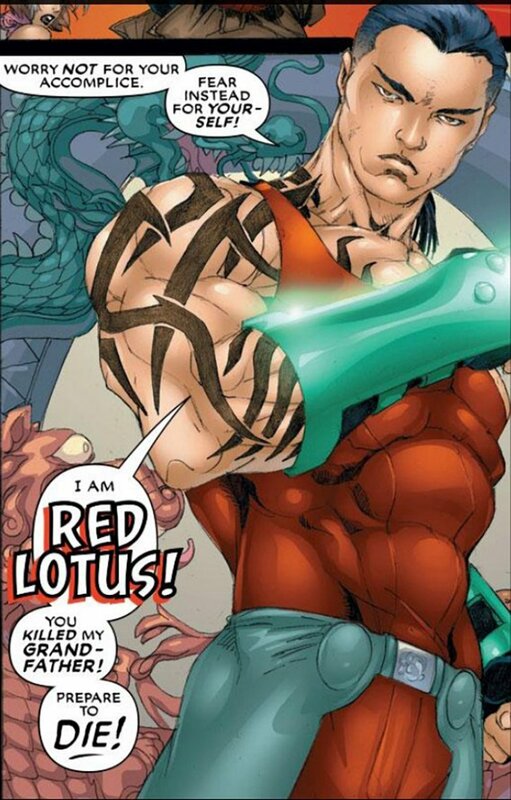 Taking the Chinese characters and plugging them into a translator, we can confirm that they read in English as "Red Lotus" — the name of a lesser-known Marvel Comics hero. For those unfamiliar with Red Lotus (not to be mistaken for the Marvel vigilante Fernanda Ramirez, best known as the Red Locust), here's a quick crash course in what he's all about. Created by Chris Claremont and Salvador Larroca, the super-powered martial artist Red Lotus was born Paul Hark in Sydney, Australia. Red Lotus believed Gambit murdered his grandfather – but when he learned truth of the situation, Red Lotus joined the X-Treme X-Men team. He went on to join Viper's undercover operations at the Hellfire Club. Despite his ties to the X-Men, Red Lotus, who was first seen in the November 2001 issue X-Treme X-Men #5, isn't an official member of the mutant coalition; he's just an adversary. Within the Deadpool 2 story, there are two slots into which Red Lotus could slide, as ComicBook.com touched on: 1) he heads up the gang that Deadpool slaughtered at the start of the film, or 2) he's the guy who gave the Merc with a Mouth a pretty penny to take out the crooks. In the first hypothetical, perhaps Deadpool kept Red Lotus' credit card as some kind of Dexter-esque souvenir; in the second, maybe the foul-mouthed anti-hero simply prefers credit card payments over cash ones. It's kind of impressive that Fox was seemingly able to secure Red Lotus' name for Deadpool 2, as we all know how complicated the legalities between Marvel and Fox have been regarding which company holds the rights to certain heroes and villains — even for one that would seemingly fall within Fox's X-Men-related purview. Thankfully, shareholders recently approved the $71.3 billion deal that will see Marvel parent company Walt Disney Studios acquire the majority of Fox's assets — including tons of Marvel characters the studio currently owns — so moves like this should become even less of a bone of contention as time moves on. And who knows? If Deadpool didn't actually slash Red Lotus to pieces in Deadpool 2, maybe after the Disney-Fox merger goes through, he'll appear in Deadpool 3 — if we actually get the third film, that is.